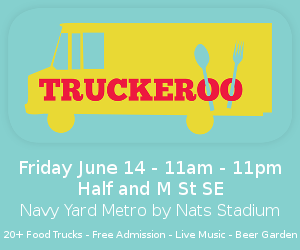 The next Truckeroo will be held on Friday, June 14 from 11am – 11pm (lunch, happy hour and dinner). A full 25 trucks will be serving the packed venue (Fairgrounds DC)! The event is located next to the Navy Yard/Ballpark metro entrance at 1299 Half Street Southeast, Washington, DC 20003. There is FREE admission & ample covered and uncovered seating provided. **Also, a new date has been added to the 2013 Truckeroo series: July 19!